Dentin hypersensitivity (DH) is a painful clinical condition commonly encountered in dental practice. It can negatively impact an individual’s quality of life by affecting dietary choices or changing oral hygiene habits [1-4]. According to the hydrodynamic theory, any stimulus that changes the fluid flow within dentin tubules can activate intradental nerve fibers and cause pain . A mechanical approach to DH management emerged from this theory and it involves occluding and/or sealing dentin tubules in order to reduce the fluid flow within tubules (i.e. dentin permeability). Theoretically, any treatment that causes a reduction in dentin permeability (DP) is considered effective in reducing DH [6, 7]. Numerous topically applied desensitizers with different modes of action are used in DH management. However, no consensus has been reached on the ideal treatment [8, 9]. In addition to evaluating the immediate efficacy of desensitizers, it is also important to evaluate the durability of treatments under conditions mimicking the oral environment (e.g. artificial toothbrushing, citric acid challenge or immersion in artificial saliva) [10-14]. In this in vitro study, we tested five different desensitizers Gluma Desensitizer Powergel, Bifluorid 12, Gluma Self Etch Bond, D/Sense Crystal and Nupro Sensodyne Prophylaxis Paste with Novamin, which are supposed to treat DH through the mechanical approach. The efficacy of the dentin desensitizers in occluding dentin tubules and reducing DP was evaluated quantitatively by a computerised fluid filtration meter (CFFM) [15, 16] and qualitatively by SEM analysis. The durability of the treatments was also evaluated following post-treatments with 6% citric acid challenge (CA) or immersion in artificial saliva (AS). Bovine incisors extracted from slaughtered animals were cleaned, stored in 10% formalin solution at 4 °C and used within 4 weeks. Mid-part tooth segments were obtained by removing the 3 mm above and 3 mm below of the cemento-enamel junction (CEJ). Dentin discs were prepared from these tooth segments by longitudinal sectioning with a low-speed water-cooled diamond saw in a precision cutting machine (Isomet-1000, Buehler, Illinois, USA). In total, 100 dentin discs with a thickness of 1 mm and with no evidence of pulp horns or coronal enamel were used. A standardized smear layer was created on both (periodontal and pulpal) sides of the dentin discs with a wet 600-grit SiC paper for 30s. 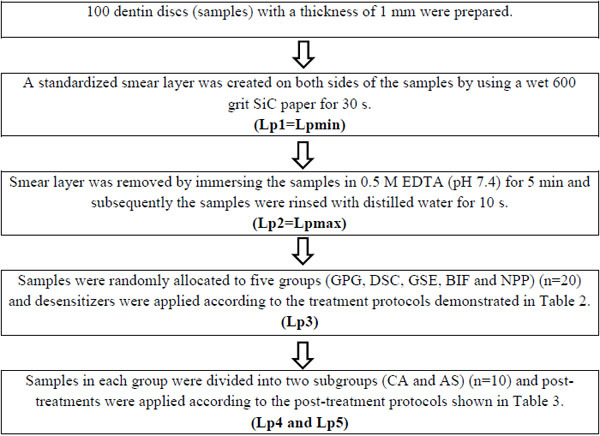 The experimental design involved repeated measurements of fluid flow (Lp) across the dentin discs as summarized in Table 1. Compositions of the desensitizers and treatment protocols for the groups are listed in Table 2. Post-treatment protocols for subgroups are listed in Table 3. Table 1. Experimental design of the study. The quantitative changes in Lp of dentin discs were measured with a CFFM working at 1.8 bar pressure (=1835.49 cmH2O), at 15 s intervals for 1.5 min. Samples were connected to the CFFM using a split chamber device. Exposed dentin area was standardized by using two identical rubber O-rings and stabilized by attaching one of them to the pulpal side of each disc with a cyanoacrylate adhesive (Pattex, Henkel, Duesseldorf, Germany). Mean values and standard deviations were calculated and the data was analysed with one way ANOVA, post-hoc Tukey’s HSD test at the 5% significance level and the paired t-test. Table 2. Compositions, manufacturers and treatment protocols of the desensitizers used in the study. LOT: 010103 Samples were immersed in protein-containing artificial dentin fluid (2% BSA solution) for 20 s in order to simulate the dentin fluid. GPG was then applied on wet dentin surface by agitating with an applicator tip for 60 s and left in place for 30 s. Rinsed with distilled water for 10 s.
LOT: 1333318 A thin layer of BIFLUORID was applied using the foam pellet and left in place for 2 min. No rinsing was applied. LOT: 010701 Since adhesion mechanism of SE adhesives involves integrating the smear into the adhesive interface, a new smear layer was created on the periodontal surfaces using a wet 600-grit SiC paper for 30 s. Rinsed with distilled water for 10 s. A thin layer of GSE was then applied by agitating with an applicator tip for 20 s, gently air-dryed for 5 s and light cured for 20 s (Elipar S10, 3M Espe, Germany). LOT: A23267 D/SENSE was applied by agitating for 1.5 min and left in place for 2 min. No rinsing was applied. LOT: 13012205 NUPRO was applied by using a rubber cup on a slow speed handpiece for 60 s. Rinsed with distilled water for 10 s.
Table 3. Post-treatment protocols used in the study. Samples were subjected to 6% CA solution for 1 min. Rinsed with distilled water for 10 s Samples were immersed in ASa solution for 24 hours at 37 0C. a The AS solution was composed of 0.2 g K2HPO4, 0.330 g KSCN, 0.260 g Na2HPO4, 1.5 g NaHCO3, 0.7 g NaCl, 1.3 g urea, 1.2 g HCl solubilized in 1000 mL deionised water, and the pH was 7.4. Fifteen dentin discs were prepared and ultrasonically cleaned with deionised water for 15 min. Experimental design steps were the same as in the DP evaluation. Groups for SEM are listed in Table 4. Dentin discs were dried in a desiccator for 12 hours, fractured prior to sputter coating with Au/Pd and examined with an SEM (JEOL JSM-7001F, Japan) at 500X-7,500X magnification at 10.0 kV. Table 4. Groups for SEM evaluation. Table 5 shows the changes in DP after desensitizer treatments, CA and AS-post-treatments. Following desensitizer treatments, Lp values decreased significantly in all groups when compared to Lpmax (p<0.05). The difference between GSE and NPP-treatment groups were statistically significant (p<0.05). DP increased significantly (p<0.05) after CA and AS post-treatments in all groups when compared to Lp3 values. Differences among CA-subgroups were not statistically significant (p>0.05). Of the AS-subgroups, only the difference between DSC-AS and BIF-AS was significantly different (p<0.05). Table 5. Changes in dentin permeability after desensitizer treatments, CA and AS post-treatments. Lp values measured after EDTA application were considered as the maximum permeability (Lpmax=100%). Other Lp values were expressed as the percentages (%) of Lpmax. The values are reported as means ± standart deviations. Post-hoc Tukey’s HSD test was used for pairwise comparisons between groups in each column. Same superscripts indicates no differences between groups in columns (p>0.05). Delta (∆) values represent the dentin permeability reduction values of the treatments (Lpmax% - Lp3%) approximately(≈). All the tested desensitizers caused morphological changes on/within the dentin tubules. In GPG-T group, most of the dentin surface was covered and transverse septas were observed within tubules. In GPG-CA and GPG-AS groups, open tubule orifices were more apparent, however some septas were still present (Fig. 1). Fig. (1a). SEM micrograph of a fractured site of dentin disc in the GPG-T Group: Note the transverse septa formations in the tubule lumen (10,000X). Fig. (1b). SEM micrograph of the top surface of dentin disc in the GPG-T Group: Occluded and partially occluded tubule orifices are visible on the dentin surface (500X). Fig. (1c). SEM micrograph of a fractured site of dentin disc in the GPG-CA Group: Transverse septa formations are visible in the tubule lumen (7,500X). Fig. (1d). SEM micrograph of the top surface of dentin disc in the GPG-CA Group: Partially occluded dentin tubule orifices and a few occluded tubules are visible at the dentin surface (2,000X). Fig. (1e). SEM micrograph of a fractured site of dentin disc in the GPG-AS Group: Transverse septa formations are visible within the tubule (10,000X). Fig. (1f). SEM micrograph of the top surface of dentin disc in the GPG-AS Group: Open dentin tubule orifices and few partially occluded tubules are apparent (2,000X). 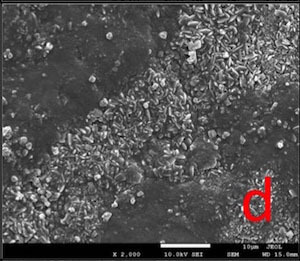 In BIF-T group, the dentin surface was covered with a resinous layer. 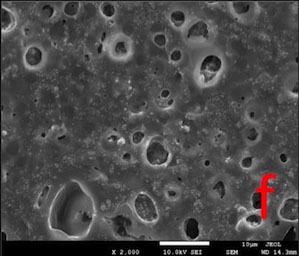 The resinous layer was semi-porous in BIF-CA and highly porous in BIF-AS groups (Fig. 2). Fig. (2a). SEM micrograph of a fractured site of dentin disc in the BIF-T Group:Note the open and partially occluded tubule orifices in the areas where the treatment agent was removed (500X). Fig. (2b). SEM micrograph of the top surface of dentin disc in the BIF-T Group: The dentin surface was completely covered with a resinous layer and there were no visible tubule orifices (2,000X). Fig. (2c). SEM micrograph of a fractured site of dentin disc in the BIF-CA Group: Open and partially occluded tubule orifices are visible in the areas where the treatment agent was removed (1,000X). Fig. (2d). SEM micrograph of the top surface of dentin disc in the BIF-CA Group: The dentin surface was covered with a semi-porous layer (2,000X). Fig. (2e). SEM micrograph of a fractured site of dentin disc in BIF-AS Group: Open and partially occluded tubule orifices were apparent in the areas where treatment agent was removed (1,000X). Fig. (2f). 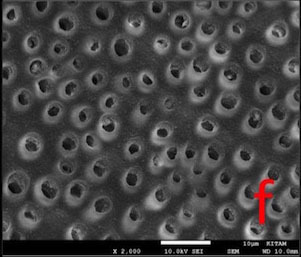 SEM micrograph of the top surface of dentin disc in BIF-AS Saliva Group: Note the porosity of the layer covering the dentin surface (2,000X). 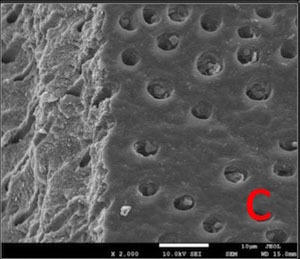 Dentin surface was covered with a hybrid layer which is homogeneous in GSE-T whereas highly porous in GSE-AS group. Resin tags extended within tubules in GSE-T, GSE-CA and GSE-AS groups (Fig. 3). Fig. (3a). SEM micrograph of a fractured site of dentin disc in GSE-T Group: Note the fractured resin tags remaining at tubule orifices and unfractured resin tags extending from the surface into the tubule orifices (4,000X). Fig. (3b). 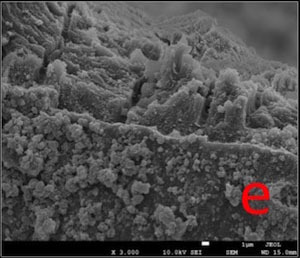 SEM micrograph of the top surface of dentin disc in GSE-T Group: Dentin surface was completely covered with a homogeneous resin layer (2,000X). Fig. (3c). SEM micrograph of a fractured site of dentin disc in GSE-CA Group: Resin tags extending into the dentin tubule orifices are visible (5,000X). Fig. (3d). 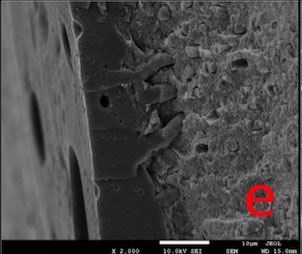 SEM micrograph of the top surface of dentin disc in GSE-CA Group: Some visible porosities are present in the hybrid layer covering the dentin surface (500X). Fig. (3e). SEM micrograph of a fractured site of dentin disc in GSE-AS Group: Note the unfractured resin tags extending into the tubule orifices (2,000X). Fig. (3f). 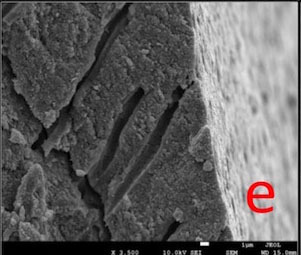 SEM micrograph of the top surface of dentin disc in GSE-AS Group: Note the porosity of the hybrid layer covering the dentin surface (2,000X). 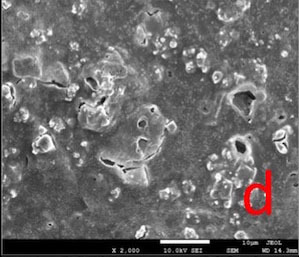 In DSC-T and DSC-CA groups, the surfaces were covered with a continuous crystalline layer. The surface layer appeared to lose its continuity in DSC-AS group, in some areas (Fig. 4). Fig. (4a). SEM micrograph of a fractured site of dentin disc in DSC-T Group: Open tubule orifices were apparent below where the surface layer was removed (5,000X). Fig. (4b). SEM micrograph of the top surface of dentin disc in DSC-T Group: Dentin surface was completely covered with a crystalline layer (2,000X). Fig. (4c). SEM micrograph of a fractured site of dentin disc in DSC-CA Group: Open tubule orifices were apparent in the areas where the treatment agent was removed as a result of fracturing (1,000X). Fig. (4e). SEM micrograph of a fractured site of dentin disc in DSC-AS Group: Crystalline layer on the surface and open tubule orifices at fractured site were visible (3,000X). Fig. (4f). 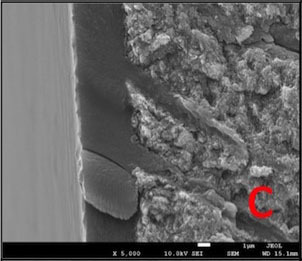 SEM micrograph of the top surface of dentin disc in DSC-AS Group: Note the crack-like appearances and the areas where the layer lost its continuity (2,000X). Most of the dentin surface in the NPP-T group was covered with an apatite-like layer. Partially occluded tubule orifices were more apparent in NPP-CA and NPP-AS groups (Fig. 5). Fig. (5a). SEM micrograph of a fractured site of dentin disc in NPP-T Group: Some apatite-like particles were observed extending within tubule orifices (2,000X). Fig. (5b). SEM micrograph of the top surface of dentin disc in NPP-T Group: Dentin surface was covered with an apatite-like layer but some porosities revealing the tubule orifices were detected on the surface layer (2,000X). Fig. (5c). SEM micrograph of a fractured site of dentin disc in NPP-CA Group: Note the particles extending within tubule orifices (2,000X). Fig. (5d). SEM micrograph of the top surface of dentin disc in NPP-CA Group: Occluded and partially occluded tubule orifices were visible on dentin surface (3,000X). Fig. (5e). SEM micrograph of a fractured site of dentin disc in NPP-AS Group: Note the apatite-like particles extending within tubule orifice (3,500X). Fig. (5f). 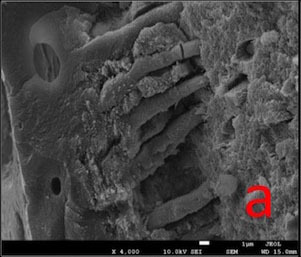 SEM micrograph of the top surface of dentin disc in NUPRO-AS Group: Partially and completely occluded tubule orifices were apparent on dentin surface (2,000X). The efficacy of desensitizers used in DH management is tested in vitro, in situ or in clinical trials. A well-established laboratory study eliminates clinically uncontrollable factors such as the subjective nature of pain perception, spontaneous remission of DH symptoms, placebo and hawthorne effects [1, 8]. The measurement of hydraulic conductance was reported to be a suitable method for evaluating DP. This method evaluates the dentin tubule occlusion efficacy of desensitizers [6, 17]. It also allows for a comparison between different treatment protocols by producing objective and quantitative values . In our study, we used the CFFM [15, 16] system to test five different dentin desensitizers. It was constituted on the basis of the conventional hydraulic conductance system [17, 19] and the reliability of it was also previously reported . 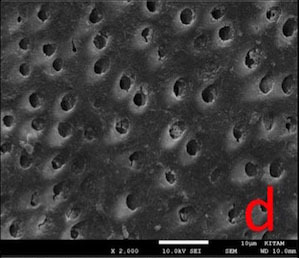 Dentin discs obtained from human or animal teeth are commonly used for in vitro DP and SEM evaluations of the desensitizers [21-23]. In our study, samples were obtained from bovine dentin around the CEJ which had been reported to be an appropriate substitute for human coronal dentin in terms of permeability characteristics . Standardization and stabilization of the exposed dentin area for DP evaluation were achieved by using O-rings in a split chamber system . Thereby, we evaluated the same area of the same specimen each time to ensure reproducibility of the measurements. The removal of the smear layer was necessary to simulate the sensitive dentin with dentin tubules patent to the oral cavity and the pulp . EDTA application caused an increase in permeability values of all specimens by removing smear layer and presented the Lpmax. The Lp3 values measured after the desensitizer treatments were significantly lower than Lpmax in all groups. This proved the immediate efficacy of all tested desensitizers in reducing DP. The immediate permeability reduction efficacy of the GSE treatment was significantly superior to the NPP treatment (p<0.05). Desensitizer treated dentin discs were subjected to CA or AS post-treatments in order to test the resistance of the deposits or layers to the acidic environment or to a wash-out effect that can be encountered in the mouth. Lp4 and Lp5 values measured following post-treatments were significantly greater than Lp3 values in all groups. There were no significant differences (p>0.05) among CA subgroups with regard to their resistance to the CA post-treatment. However, in terms of their durability against AS post-treatment, DSC was superior to BIF (p<0.05) (Table 5). Gluma Desensitizer Powergel contains 35% HEMA and 5% glutaraldehyde which coagulates the serum albumin in dentinal fluid. The reaction of glutaraldehyde with albumin induces polymerization of HEMA. [26-32] Since dentin desensitization mechanism of glutaraldehyde-based desensitizers depends on protein precipitation, simulating the dentinal fluid in vitro is necessary [28-30]. In order to simulate the protein-containing dentinal fluid, samples in this group were immersed in 2% bovine serum albumin solution (BSA) before GPG treatment. In the current study, BSA acted as an artificial dentin fluid, in accordance with some other studies [28, 29]. 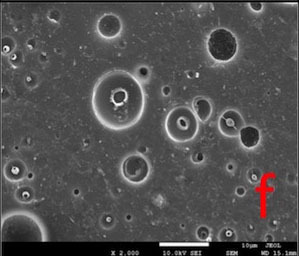 SEM images (Fig. 1) proved that post-treatment procedures removed most of the surface layer that was formed as a result of HEMA polymerization, possibly due to the water solubility of HEMA [31, 32]. Transverse septas formed within some tubules as a result of protein precipitation were detected even after post-treatments. This may explain why permeability value did not return to maximum level (100%). In our in vitro model, we expected the BSA to infiltrate within all tubules completely in order to enable the protein precipitation. However, some empty tubule lumens with no septa formations we observed probaply means that this aim could not be achieved. Bifluorid 12 is a fluoride varnish containing 6% calcium fluoride (CaF2) and 6% sodium fluoride (NaF). Its mode of action is to create a barrier on the dentin surface by precipitation of CaF2 and NaF [33, 34]. 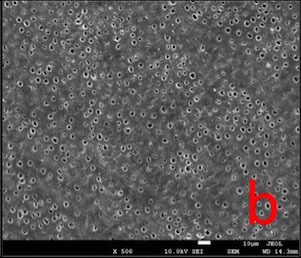 In this study the resinous layer lost its continuity and therefore its quality as a barrier after post-treatments (Fig. 2) and caused a re-increase in permeability. Gluma Self Etch Bond is a one-step, HEMA containing 7th generation self-etching (SE) dentin adhesive. 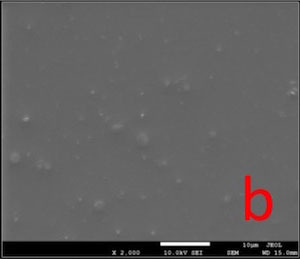 Since adhesion mechanism of SE adhesives involves integrating the smear into the adhesive interface [35, 36], we created a new smear layer on the surface of each dentin discs in this group, prior to GSE application. 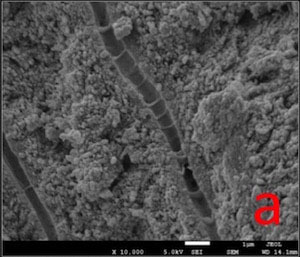 Topical application of SE adhesives was reported to be effective in reducing DP by sealing the dentin surface with an acid-resistant hybrid layer and by occluding the tubule orifices with resin tags [34, 37], which was also demonstrated in our study. Porosity of the surface hybrid layer caused by post-treatments explains the re-increase in permeability. However, resin tags that were still present within the tubules even after the post-treatments might explain why permeability value did not return to maximum value (Fig. 3). D/Sense Crystal is a desensitizer containing 2.5% potassium binoxalate and 2.5% nitric acid in water. 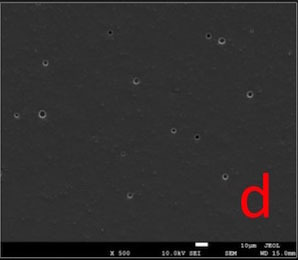 DSC was reported to have a dual action in managing DH by reacting with dentin and triggering the precipitation of insoluble calcium oxalate crystals which cover the surface. It has also been reported to reduce nerve excitability via soluble potassium ions penetrating within tubules . 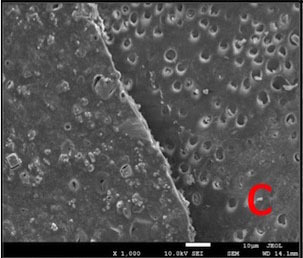 In this study, the dentin surface appeared to be covered with a crystalline layer, even after both post-treatments (Fig. 4). Considering this, lower permeability values might be expected. However, it is important to note that the hydrostatic pressure we utilised (1835.49 cm H2O) was much higher than the physiological pulpal pressure (15 cm H2O) . This might have facilitated the removal of crystalline deposits from the surface during permeability measurements, thereby leading to a greater Lp value than we would have obtained if we had chosen a hydrostatic pressure value close to the physiological pulp pressure. On the contrary to the permeability evaluation, SEM analyses were conducted without simulating pulpal pressure and no hydrostatic pressure was applied on samples. Our study is consistent with several in vitro studies [10, 14] in terms of reporting the immediate efficacy of DSC treatment in reducing the permeability. Various studies [10, 14, 39-41] with different experimental designs also reported the solubility of the calcium oxalate crystals, as well as the re-increase in permeability after AS post-treatment over time. Nupro Sensodyne Prophylaxis Paste with novamin contains 15% novamin as an active ingredient. Novamin is a trade name for calcium sodium phosphosilicate bioactive glass. It is incorporated into dentifrices and in-office products as a remineralizing agent . Novamin-based remineralizing products are reported to reduce DH by physically occluding dentin tubules with hydroxycarbonate apatite (HCA) and with residual novamin particles . In our study, following the post-treatments, some of the apatite-like surface deposits were removed, thereby an increase in Lp occurred. However, some reduction in the diameter of tubule lumens was maintained even after the post-treatments (Fig. 5) and this may explain why the permeability value did not reach to maximum. The results of this study are compatible with several studies [11, 44, 45] reporting the decrease in permeability following novamin-based treatment and some other studies [11, 44] demonstrating the re-increase in permeability following CA post-treatment. Novamin-based bioactive glasses are assumed to react in an aqueous environment (ie. saliva), resulting in HCA deposition [12, 42, 43]. In the current study, we did not detect a remineralization effect of the NPP treatment following AS post-treatment for 24 hours. In addition, the wash-away effect of AS was superior to a possible remineralization mechanism. This finding of our study was comparable with the results of several investigations that studied novamin-based products and did not detect dentin remineralization after 24 or 48 hours of storage in RSS solution  or immersion in AS  for 24 hours. It has been suggested that 24 hours of storage in AS might not be sufficient to test for possible remineralization . Recently, several investigators indicated that bioglass in dentrifices causes desensitization by physically occluding the tubules rather than by enhancing remineralization. It was also noted that conventional bioglasses (e.g. novamin) incorporated into dentifrices cause HCA deposition. However, fluoride containing novel bioglass components are able to form a more stable and acid-resistant fluoroapatite layer on tooth surfaces and may give better results in DH management . Dentin permeability evaluation allows for a comparison between different treatment protocols by producing objective, quantitative values. However, a direct comparison of the quantitative data from different studies might not be possible because of the differences in methodologies e.g. differences in samples, treatment and post-treatment protocols, hydrostatic pressure values and artificial dentinal fluids. All the tested desensitizers were effective in reducing DP by covering or occluding dentin tubules. From a clinical standpoint, it is important that a dental clinician should be aware of the post-treatment durability of the desensitizers to be used and consider the need to recall the patient and repeat the treatment. In the current study, CA and AS post-treatments caused some reduction in the efficacy of all desensitizers by partly removing the deposits or layers formed on/within the tubules and caused a re-increase in permeability. In our study, we evaluated the efficacy and durability of five different desensitizers for their tubule occluding and permeability reducing abilities. In cases where they possessed another mode of action in DH management (e.g. changing nerve excitability), these properties were not evaluated. Research into the development of desensitizer treatment modalities more resistant to the oral environment may eventually contribute to more prolonged patient relief from discomfort associated with DH. This study was supported by The Scientific and Technological Research Council of Turkey (project number 114S019). The authors also thank Heraus Kulzer TURKEY for donating the Gluma Desensitizer Power Gel, Dentsply UK for donating the Nupro Sensodyne Prophylaxis Paste with novamin, Dr. Sevgi CANBAZ (Ondokuz Mayis University) for the statistical analyses and Gregory T. Sullivan (GPEM, University of Queensland, Brisbane, Australia) for editing the English in an earlier version of this manuscript. Dababneh RH, Khouri AT, Addy M. Dentine hypersensitivity - an enigma? A review of terminology, epidemiology, mechanisms, aetiology and management. Br Dent J 1999; 187(11): 606-11. Chu CH, Lo EC. Dentin hypersensitivity: a review. Hong Kong Dent J 2010; 7: 15-22. Goh V, Corbet EF, Leung WK. Impact of dentine hypersensitivity on oral health-related quality of life in individuals receiving supportive periodontal care. J Clin Periodontol 2016; 43(7): 595-602. Li MH, Bernabé E. Tooth wear and quality of life among adults in the United Kingdom. J Dent 2016; 55: 48-53. Brannstrom M, Astrom A. A study on the mechanism of pain elicited from the dentin. J Dent Res 1964; 43: 619-25. In: Anderson DJ, Matthews B, Gorretta C. Fluid flow through human dentin. Arch Oral Biol 1967; 12: 209-16. Pashley DH. Dentin permeability, dentin sensitivity, and treatment through tubule occlusion. J Endod 1986; 12(10): 465-74. Pashley DH. How can sensitive dentine become hypersensitive and can it be reversed? J Dent 2013; 41(Suppl. 4): S49-55. Talioti E, Hill R, Gillam D. The efficacy of selected desensitizing OTC products: a systematic review. ISRN Dent 2014. Article ID 865761, 14 pages. Shiau HJ. Dentin hypersensitivity. J Evid Based Dent Pract 2012; 12(3)(Suppl. ): 220-8. 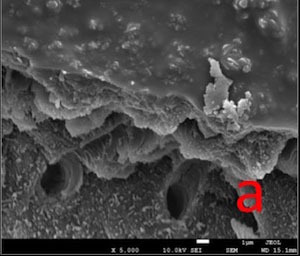 Gandolfi MG, Silvia F, H PD, Gasparotto G, Carlo P. Calcium silicate coating derived from Portland cement as treatment for hypersensitive dentine. J Dent 2008; 36(8): 565-78. 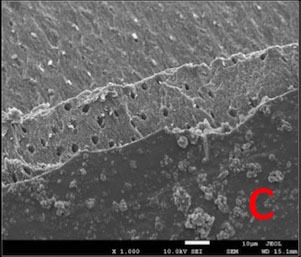 Sauro S, Watson TF, Thompson I. Dentine desensitization induced by prophylactic and air-polishing procedures: an in vitro dentine permeability and confocal microscopy study. J Dent 2010; 38(5): 411-22. Wang Z, Sa Y, Sauro S, et al. 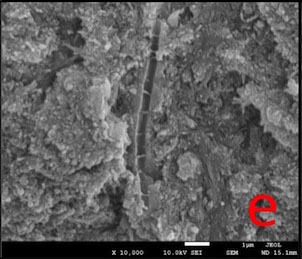 Effect of desensitising toothpastes on dentinal tubule occlusion: a dentine permeability measurement and SEM in vitro study. J Dent 2010; 38(5): 400-10. Wang Z, Jiang T, Sauro S, et al. 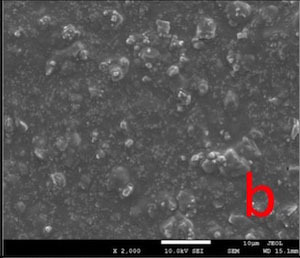 The dentine remineralization activity of a desensitizing bioactive glass-containing toothpaste: an in vitro study. Aust Dent J 2011; 56(4): 372-81. 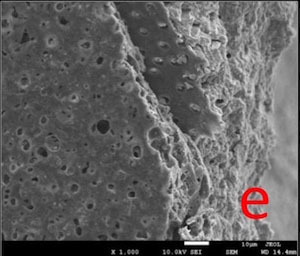 Gandolfi MG, Iacono F, Pirani C, Prati C. The use of calcium-silicate cements to reduce dentine permeability. Arch Oral Biol 2012; 57(8): 1054-61. Oruçoğlu H, Sengun A, Yilmaz N. Apical leakage of resin based root canal sealers with a new computerized fluid filtration meter. J Endod 2005; 31(12): 886-90. 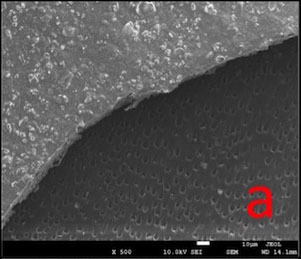 Orucoglu H, Belli S. Evaluation of the effect of four self-etching adhesives on dentin permeability. J Biomed Mater Res B Appl Biomater 2009; 90(1): 110-5. Greenhill JD, Pashley DH. The effects of desensitizing agents on the hydraulic conductance of human dentin in vitro. J Dent Res 1981; 60(3): 686-98. Elgalaid TO, Creanor SL, Creanor S, Hall AF. The repeatability of human dentine permeability measurement in vitro. J Dent 2008; 36(1): 42-8. Orucoğlu H, Şengün A, Yilmaz N, Kont Çobankara F. Yeni Bir Bilgisayarlı Sıvı Filtrasyon Ölçüm Cihazının Güvenilirlik Analizi. Cumhuriyet Üniversitesi Dişhekimliği Fakültesi Dergisi 2005; 8: 98-104. [In Turkish, English abstract]. Mordan NJ, Barber PM, Gillam DG. The dentine disc. A review of its applicability as a model for the in vitro testing of dentine hypersensitivity. J Oral Rehabil 1997; 24(2): 148-56. Schmalz G, Hiller KA, Nunez LJ, Stoll J, Weis K. Permeability characteristics of bovine and human dentin under different pretreatment conditions. J Endod 2001; 27(1): 23-30. Yassen GH, Platt JA, Hara AT. Bovine teeth as substitute for human teeth in dental research: a review of literature. J Oral Sci 2011; 53(3): 273-82. Outhwaite WC, McKenzie DM, Pashley DH. A versatile split-chamber device for studying dentin permeability. J Dent Res 1974; 53(6): 1503. Rusin RP, Agee K, Suchko M, Pashley DH. 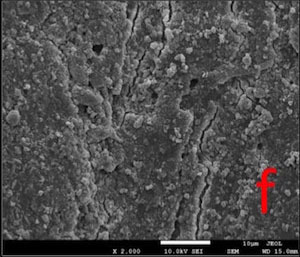 Effect of a new desensitizing material on human dentin permeability. Dent Mater 2010; 26(6): 600-7. Qin C, Xu J, Zhang Y. Spectroscopic investigation of the function of aqueous 2-hydroxyethylmethacrylate/glutaraldehyde solution as a dentin desensitizer. Eur J Oral Sci 2006; 114(4): 354-9. Larson TD. Clinical uses of glutaraldehyde/2-hydroxyethylmethacrylate (GLUMA). Northwest Dent 2013; 92(2): 27-30. 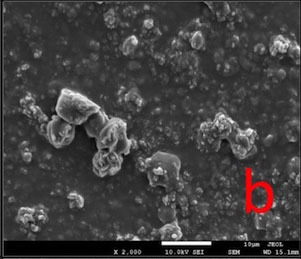 Ishihata H, Finger WJ, Kanehira M, Shimauchi H, Komatsu M. In vitro dentin permeability after application of Gluma® desensitizer as aqueous solution or aqueous fumed silica dispersion. J Appl Oral Sci 2011; 19(2): 147-53. 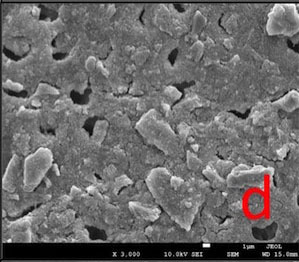 Ishihata H, Kanehira M, Finger WJ, Shimauchi H, Komatsu M. Effects of applying glutaraldehyde-containing desensitizer formulations on reducing dentin permeability. J Dent Sci 2012; 7: 105-10. Huh JB, Kim JH, Chung MK, Lee HY, Choi YG, Shim JS. 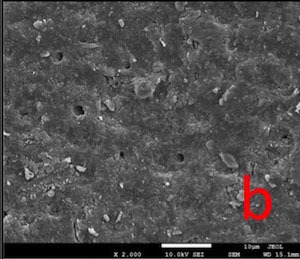 The effect of several dentin desensitizers on shear bond strength of adhesive resin luting cement using self-etching primer. J Dent 2008; 36(12): 1025-32. Schüpbach P, Lutz F, Finger WJ. Closing of dentinal tubules by Gluma desensitizer. Eur J Oral Sci 1997; 105(5 Pt 1): 414-21. Duran I, Sengun A, Yildirim T, Ozturk B. In vitro dentine permeability evaluation of HEMA-based (desensitizing) products using split-chamber model following in vivo application in the dog. J Oral Rehabil 2005; 32(1): 34-8. Maas JR, Junior IM, Lodi CS, Delbem AC. Differences in loosely bound fluoride formation and anticaries effect of resin-based fluoride varnishes. Int J Paediatr Dent 2013; 23(3): 166-72. Yu X, Liang B, Jin X, Fu B, Hannig M. Comparative in vivo study on the desensitizing efficacy of dentin desensitizers and one-bottle self-etching adhesives. Oper Dent 2010; 35(3): 279-86. Sezinando A. Looking for the ideal adhesive–a review. Rev Port Estomatol Cir Maxilofac 2014; 4: 194-206. Sauro S, Pashley DH, Montanari M, et al. 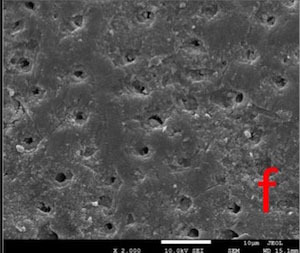 Effect of simulated pulpal pressure on dentin permeability and adhesion of self-etch adhesives. Dent Mater 2007; 23(6): 705-13. Stenvik A, Iversen J, Mjör I. Tissue pressure and histology of normal and inflamed tooth pulps in macaque monkeys. Arch Oral Biol 1972; 17: 1501-11. In: Pashley DH. How can sensitive dentin become hypersensitive and can it be reversed? J Dent 2013; 41: S49-55. Kerns DG, Scheidt MJ, Pashley DH, Horner JA, Strong SL, Van Dyke TE. Dentinal tubule occlusion and root hypersensitivity. J Periodontol 1991; 62(7): 421-8. Suge T, Ishikawa K, Kawasaki A, Yoshiyama M, Asaoka K, Ebisu S. Duration of dentinal tubule occlusion formed by calcium phosphate precipitation method: in vitro evaluation using synthetic saliva. J Dent Res 1995; 74(10): 1709-14. Thanatvarakorn O, Nakashima S, Sadr A, Prasansuttiporn T, Ikeda M, Tagami J. 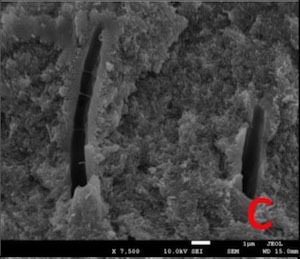 In vitro evaluation of dentinal hydraulic conductance and tubule sealing by a novel calcium-phosphate desensitizer. J Biomed Mater Res B Appl Biomater 2013; 101(2): 303-9. Milleman JL, Milleman KR, Clark CE, Mongiello KA, Simonton TC, Proskin HM. NUPRO sensodyne prophylaxis paste with NovaMin for the treatment of dentin hypersensitivity: a 4-week clinical study. Am J Dent 2012; 25(5): 262-8. Spolsky VW, Black BP, Jenson L. Productsold, new, and emerging. J Calif Dent Assoc 2007; 35(10): 724-37. Sauro S, Thompson I, Watson TF. Effects of common dental materials used in preventive or operative dentistry on dentin permeability and remineralization. Oper Dent 2011; 36(2): 222-30. 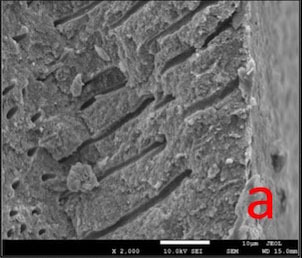 Sauro S, Watson TF, Thompson I. Ultramorphology and dentine permeability changes induced by prophylactic procedures on exposed dentinal tubules in middle dentine. Med Oral Patol Oral Cir Bucal 2011; 16(7): e1022-30. Lynch E, Brauer DS, Karpukhina N, Gillam DG, Hill RG. Multi-component bioactive glasses of varying fluoride content for treating dentin hypersensitivity. Dent Mater 2012; 28(2): 168-78.